I have posted previously about attending a cooking class where we learned to make three different kinds of bread. Having tried the Refrigerator French Bread and the Cottage Onion Dilly Bread and enjoyed those, I really wanted to give this third recipe (which our instructor referred to as Skillet Bread) a try. If you follow me on Twitter or Facebook you may have seen my excited posts about winning a Le Creuset French Oven from Jamie at My Baking Addiction. If you haven't checked out Jamie's blog, you MUST! 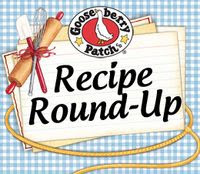 Her bog has wonderful recipes and photos along with fun giveaways. 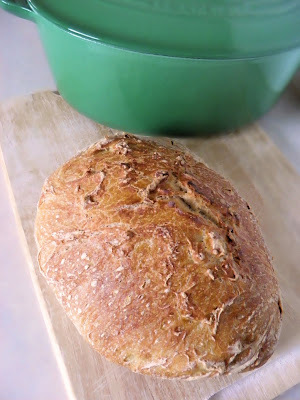 This week my beautiful French Oven arrived and I knew it would be perfect for making this bread recipe. As I looked on the Internet at various bread recipes baked in French/Dutch ovens, I realized that the cooking class instructor must have adapted this recipe from New York Times Recipe: No-Knead Bread which has been posted and raved about all over the Internet. I now know that I must indeed be the last person in the world to try a version of this recipe. The New York Times recipe was adapted from Jim Lahey's recipe of Sullivan Street Bakery. My cooking class instructor's version is a little different. And I am pretty sure he kneaded his dough quite a bit during the class presentation. Maybe that is why he called it "Skillet Bread" instead of "No-Knead Bread". I also found I had to knead the bread for awhile before it became "easy to handle" as the directions indicated. Maybe I shouldn't have kneaded it so much? I am not sure, but the bread did taste really good. This is an easy recipe, but it does have long rise times. In my opinion, this bread is definitely worth the wait. Have you made this bread? I would enjoy hearing about your experience with it. One thing to note when using recipes that require high baking temperatures is that Le Creuset lid knobs are oven safe to 375°F. They do have a stainless steel knob which can be purchased separately and is safe for higher temperatures. Not wanting to damage my knob, I replaced it with an enameled cast iron knob from a different lid that is oven safe at higher temperatures. So this is another option for those concerned about damaging their Le Creuset lid knobs. A simple bread recipe that is baked in a skillet or dutch oven. 1. Heat water to 110°-120°F.2. Stir flour, yeast, and salt together then add the water and mix until dough forms.3. Cover bowl with a dish towel and let rise 12 - 14 hours.4. Transfer dough onto a well floured board and knead several times until flour is incorporated and dough is easy to handle.5. Place dough into a greased bowl and let rise for 4 more hours.6. Place heavy cast iron skillet with lid or enameled cast iron Dutch/French oven into the oven and preheat to 425°F.7. When hot, remove skillet or Dutch/French oven, carefully uncover, and gently "pour" dough from bowl into hot vessel and cover.8. Bake for 20 minutes in 425°F oven, then remove cover and bake for another 20 - 30 minutes.9. Cool on a wire rack. Yep this we make three times a month can't enough and toasted it just wonderful if it last! Nice job! Hi, The name of this bread really got my attention. What does cooking in the skillet do for it? Does that give the bread a crispy crust? It looks very tempting! Hi Bonnie--Yes, it does have a very crispy crust. And because it is covered, it steams it. OK Roxana! That's good to know! I don't feel so bad now! This bread look awesome..I am huge bread lover, and I can tell that you did fantastic job!!! Look so crispy and delicious!! Hi Jill-This bread is one of our all-time favorites. My daughter Lora has made this in the Dutch oven, and posted the recipe on her blog, as well. 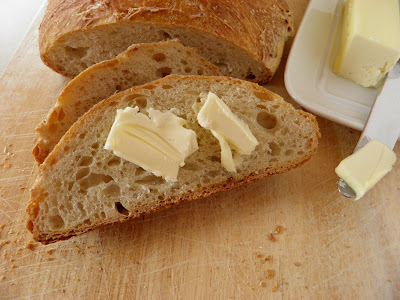 Love the bread, so crunchy on top, and so moist, and delicious. Fresh crusty bread and butter may be the closest thing to heaven I can think of. Looking at your photo just warms me right up.